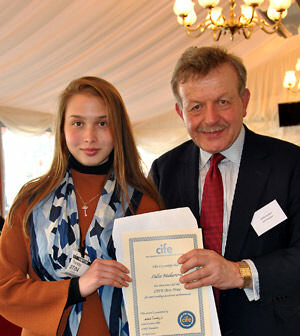 Each year CIFE Awards prizes to the very best students from all its colleges. One in every 100 students do well enough to win an award, so we’re delighted that two Ashbourne students received prizes this year. Lidia Makarova received the CIFE award for Visual and Creative Arts. Lidia is one of the most talented artists it has ever been Ashbourne’s pleasure to teach. She is an exceptionally committed and dedicated student. In shaping her work, which is far above the usual standard at A level, she is totally unique. Lidia is very creative and works comfortably with various media in 2 and 3 dimensions. In History of Art her essays were rarely short of excellent and consistently showed flair, imagination, and independent thinking of a level unusual in someone of her age – they were often a delight to read and remarkable for a student whose second language is English. Lidia is described as unquestionably one of the very best students that her teacher has had in 10 years of teaching Art History. 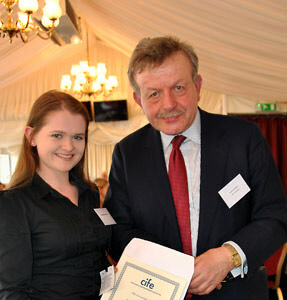 Nicola Brownless won a CIFE College Award for her outstanding contribution to life at Ashbourne. Culminating with her remarkable A level results of A*AA in English Literature, Drama and Psychology, Nikki’s achievements at Ashbourne included her appointment as Head Girl in her final year, her role as student ambassador at parents’ and open evenings and her outstanding contribution to our drama department including participating in our annual college revues. She was a model student, unrelenting in her pursuit of excellence. An engaged and willing learner, she listened always to constructive advice and criticism. Polite, courteous and, possessing a sharp wit and sense of humour, Nikki always seemed to be cheerful. Her self-actualization and her determination to push against boundaries and limitations and devise creative solutions to problems made Nikki a truly amazing student.